Justice League Has a Post-Credit Scene, What Is It? You're going to need to sit through all of the credits when you see Justice League next weekend, DC fans. While in no way has the DCEU made a religion out of post-credit scenes in the way that the Marvel Cinematic Universe has, with any sort of massive franchise movie these days, the possibility of one being included can't be ruled out. And now it's been confirmed by star Jason Momoa that Justice League does indeed have a post-credit sequence. Jason Momoa, who plays Aquaman in Justice League, has been making the press rounds in order to promote the movie. During a recent interview, he was asked about whether or not the movie contains a post-credit scene. While these are kind of meant to be a surprise, they are now something that the audience expects to some degree, so Momoa didn't hesitate to answer. Here's what he had to say about it. "They do, they do. You've gotta sit through the whole thing and go through the credits... I forgot that it was in the script. It's fantastic." 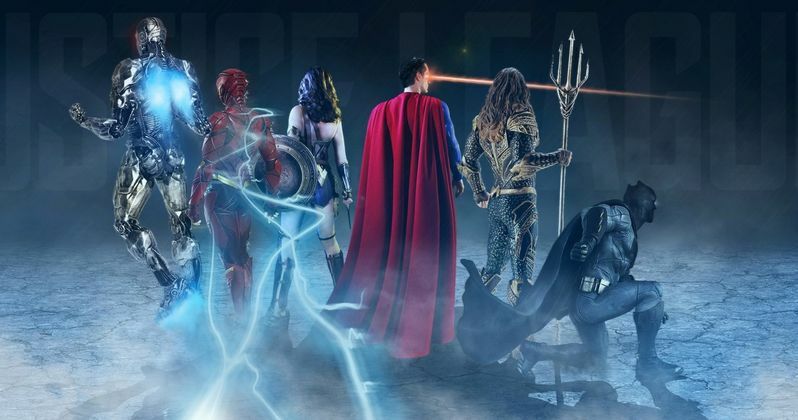 While Jason Momoa didn't spoil what Justice League shows in its post-credit scene (which is for the best), he did give us some tidbits about it. For one, it sounds like it's going to be at the very end of the credits. Not a mid-credits scene, as many of the Marvel movies have started doing. It's also revealed that this particular post-credit scene was something that was included in the script. So this particular scene isn't something that was forced in by the studio. This was something that either Zack Snyder or Joss Whedon, who did rewrites and handled the reshoots on Justice League, intended to be part of the movie. In truth, the DCEU hasn't had a post-credit sequence that was overly significant up to this point. In fact, the only movie in the universe to contain any sort of post-credit sequence is Suicide Squad, which features Ben Affleck's Bruce Wayne speaking with Viola Davis' Amanda Waller about the Justice League. At that point, had we not known a Justice League movie were happening, it would have been a much bigger deal. Ultimately, it just served as a little tease for Justice League, which finally arrives in theaters on November 17. As for what this post-credit scene may contain? There are plenty of options, but since Aquaman is the next movie coming out as part of the DCEU next December, it seems very likely this scene could be teasing Arthur Curry's first solo movie. Given Jason Momoa's enthusiasm in this interview with BBC Radio 2, it wouldn't be too surprising if that turns out to be the case. There's also the possibility this post-credit scene could help set up Justice League 2, but that's pure speculation at this point. Luckily, we won't have to wait too much longer to find out.